I just read A Sense of the Infinite, and I thoroughly enjoyed it. 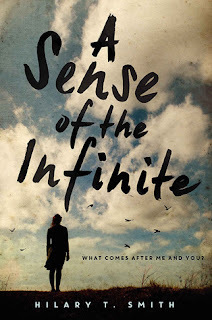 A Sense of the Infinite is Hilary T. Smith's second YA novel. I was a fan of the author before even picking up the book because she was INTERN. Do you remember INTERN? I've been blogging since 2009, which makes me practically ancient in blog years. "Hey, you kids! Get off my lawn!" For those of you who don't remember, Hilary T. Smith blogged anonymously as INTERN while working as an intern in the publishing industry. Her insightful blog was helpful to writers, fun to read, and it had a ton of voice. When I heard Hilary was going to be doing a signing nearby, I became geeky-excited (hard to imagine, I'm sure). Then I met her and she was incredibly nice and normal, and she asked about my writing and I babbled way too much, and that meeting is why I feel it's okay if I refer to her as "Hilary" instead of "Ms. Smith" or "the author" for this post. So there. There are so many things I love about this book, including Hilary's gorgeous writing voice. I read it was a "quiet" book before I picked it up, but that doesn't feel quite right to me because so much happens in the story. True, it's not vampires, post-apocalyptic, the story of one teen saving all of humanity, or something involving aliens. And while I love stories that fall into all of those categories--I myself usually include fantasy or magic in my own--I also enjoy realistic fiction, quiet or not. I love A Sense of the Infinite for the story, the "what happens," the secrets, the characters, and how the characters develop. It's senior year of high school, and Annabeth is ready--ready for everything she and her best friend, Noe, have been planning and dreaming. But there are some things Annabeth isn't prepared for, like the constant presence of Noe's new boyfriend. Like how her relationship with her mom is wearing and fraying. And like the way the secret she's been keeping hidden deep inside her for years has started clawing at her insides, making it harder to eat or even breathe. For years, Noe has anchored Annabeth and set their joint path. Now Noe is drifting in another direction, making new plans and dreams that don't involve Annabeth. 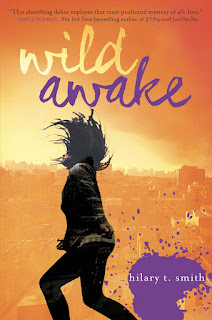 Without Noe's constant companionship, Annabeth's world begins to crumble. But as a chain of events pulls Annabeth further and further away from Noe, she finds herself closer and closer to discovering who she's really meant to be--with her best friend or without. I found A Sense of the Infinite unputdownable. Annabeth is a compelling character. She's fully relatable and empathetic, and she's interesting in her life, her strengths, her weaknesses, and her decisions. Hilary's language is beautiful, and I love her use of similes and metaphors--and the lovely words and similes feel natural coming from Annabeth, a senior in high school. Annabeth's voice sounds modern and intelligent, but also authentic and grounded in real teen-speak. It's challenging, writing with a poetic voice that doesn't sound too old, too lofty, or out of character, but Hilary nails it. All of the characters feel complete, imperfect in a wonderful way, and real. Again, I shy away from writing too many story deets that might spoil a book, so without going into detail I'll tell you there's a subtlety in the writing that allows the reader to infer, and it helps make the book feel true and real. Also, anyone who writes for children or teens knows it can be challenging to have adults in the book while not having them solve the problems for the protagonist, look neglectful, or seem like cardboard cutouts. Hilary expertly handles the adult issue. Annabeth's mother is a great and important character who remains empathetic through the ups and downs in her relationship with her daughter. I think all of the adult characters feel real or at least realistic in how they're being viewed by a teen. The characters can't be pigeonholed because they're three-dimensional, and the decisions they make feel organic. This book is a superb example of so many things we strive for in writing, and one is to make our characters active in their choices, active in their lives. I've lately been zooming in extra close on what (and how much) to show and tell as I revise my own work-in-progress, so I can't help but pay attention to those things in the books I'm reading and shows I'm watching. We can't help notice that, right? Once you're a writer, you read and take in the story differently, for better or worse. I remember reading some quote by an author (Who? Can't remember!) saying that deciding what to show and tell is one of the biggest parts of crafting a novel, and I think I agree. As I read A Sense of the Infinite, I had to ask myself a few times if I'd have chosen differently in some of the scenes. I think I would have shown different parts of a few big scenes in my first draft (if I could have written this book, which I couldn't have), and I hope I would have eventually had the wisdom to revise it as Hilary did. See, I think she chose just right. That's part of what made me so hungry to keep turning pages. The book is beautifully crafted, and I highly recommend reading it. Now it's sharing time! Here's my INTERN-autographed book! Personalized! To me! The title of Hilary's first book is Wild Awake. I totally want to read it! How about you? Have you read A Sense of the Infinite? Did you follow INTERN? Have any authors made you geeky-excited? Have you read anything great lately? Tell me, tell me, tell me! listening for whispers of what each one was or could be. We search beyond the scratches, the tired limbs, the cobwebs. 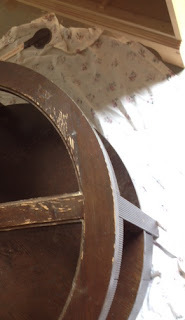 Strong wood—a solid form—lies underneath a rough surface. and then wipe away the dust to see what we have. It gets messy before it gets pretty. giving each piece new life. once we have strong wood and a solid form. before we can add the polish. I’m revising now. I’m eager to see what I’ll have when this very special piece is refinished. How about you? Where are you in the process?